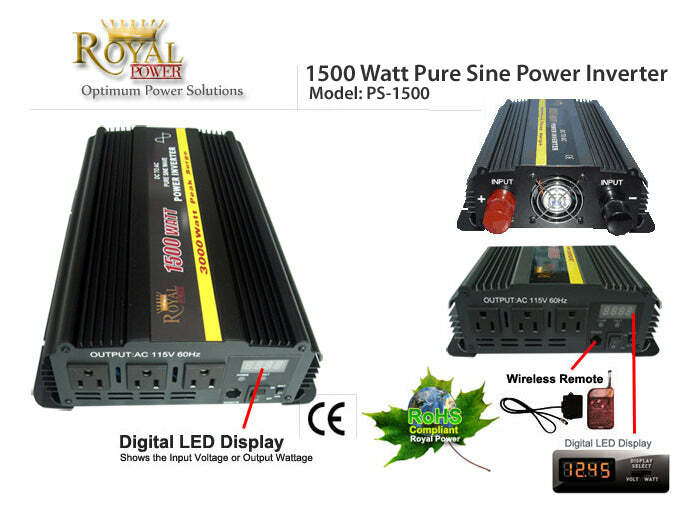 The 1500 watt 12 volt dc to 120 volt ac pure sine wave power inverter outputs a pure sine wave of stable current. With a pure sine wave dc to ac power inverter you can operate all types of electronics up to 12.5 amps. The Royal Power PS-1500 includes digital LED monitoring which allows you to view the battery voltage and wattage applies. This inverter converts 12 volt battery power into 120 volt household current. With 1500 watts of alternating current your can operate a large range of medical equipment, audio equipment and sensitive electrical machinery. 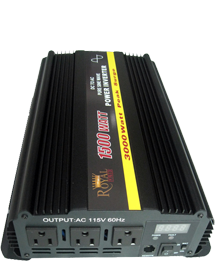 This 1500 watt inverter plugs directly to a 12 Volt DC battery to power large appliances, air conditioners, heavy duty power tools and many other electronics in your vehicle, or on a free standing 12V battery. This inverter also includes a USB port an excellent addition for battery chargers. Incandescent light, power tools, 32"TV, fridge (16 cu ft),8 gallon vacuum cleaner, 800W microwave oven.